Google AdWords broadmatch is very broad. In fact it’s broader than I had thought. Essentially, AdWords knows that “attorney” means “lawyer” “law firm” and lots of other variants. It is so broad, in fact, that branded queries for law firms: (i.e. Smith Jones and Williams”) are starting to turn up ads for competing law firms, even though there’s nothing in the branded query that denotes a law firm specifically. Semantically, “Smith Jones and Williams” could be accounting, or a pizza restaurant, or a document or an island, or a treaty from the 1700s… but Google has learned that people looking for that specific firm are actually looking for a criminal defense lawyer and are showing ads for other localized criminal defense lawyers. Here’s an example I did from my Seattle office, for a huge personal injury law firm in Texas. 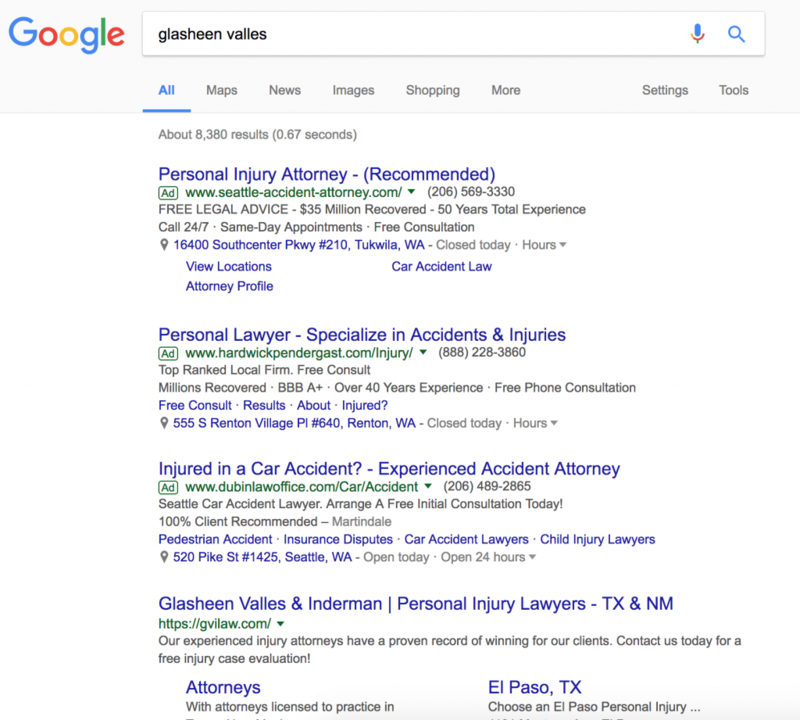 Note that three ads for Seattle based PI firms show up for the very specific query: “Glasheen Valles”. Lawyers should bid on their own brand name. This includes the firm as well as individuals. Broad match in AdWords may be a path towards spending a lot of money on expensive PPC terms. A sophisticated campaign should be MUCH more specific.